So many attractive stallions at the same place yesterday evening in Niedersachenshalle in Verden, and for the first time ever with Schockemöhle stallions in Verden. This evening was the second stallion show with the new stallion cooperation between Helgstrand & Schockemöhle, and for sure the spectators got a special show. Top price stallions, Champion Stallions, World Champions, Bundeschampions and Performance test winners what more could you wish for wether your are a passionate breeder, a rider or just curious to watch the best. Super movers, black, bay, chestnut or grey - your choice. For sure another very interesting World Championship year comes up (Ermelo 1 - 4 August). The presentation started at 19:00 and not a single seat was free in the arena - everyone was ready. The hosts of the evening Paul Schockemöhle and Andreas Helgstrand welcomed the audience including the viewer at Clipmyhorse. 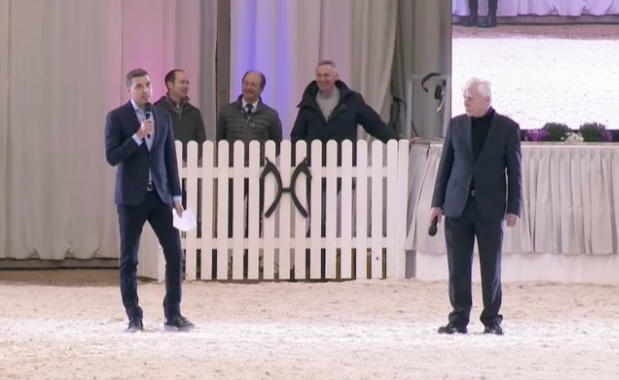 This was the first time ever that live stream was a part of the stallion presentation for Schockemöhle stallions. Ones again Peter Stojanow was on the spot capturing the great evening. Final with World Champions Revolution and D´avie. Next time many of those top stallions will be shown is at Danish Warmblood stallions show 6-10 March - secure your tickets here.